"I made these for the first time this past Christmas and they have become the family's new favorite cookie! 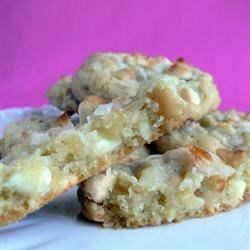 The white chocolate gives a rich taste to these cookies. I guarantee you will love them." In a medium bowl, cream together the butter and sugar. Stir in the egg and vanilla. Combine the flour, baking soda and salt, stir into the creamed mixture. Finally, stir in the white chocolate and nuts. Drop cookies by heaping teaspoonfuls onto an ungreased cookie sheet, about 2 inches apart. Bake for 8 to 10 minutes in the preheated oven, until lightly browned. Cool on wire racks. When cool, store in an airtight container. First batch spread WAY to much. After refrigerating they were ok, but not the best I've tasted. Another recipe I've tried has butter and shortening,, I prefer that one.